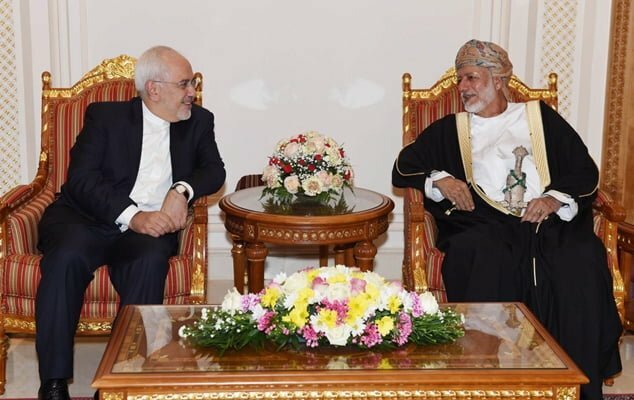 During his short stay in Muscat, Zarif held talks with his Omani counterpart Yusuf bin Alawi. At the meeting, which was held within the framework of regular consultations between Iranian and Omani delegations, Zarif and bin Alawi exchanged views on mutual as well as regional and international issues. Zarif’s visit to Muscat comes as he is expected to join the high-ranking delegation accompanying President Rouhani during his Monday trips to Bern and Vienna. Iran and Oman share diplomatic and economic ties dating back to decades ago. Both countries are members of the Organization of Islamic Cooperation, the Non-Aligned Movement and the Group of 77. Iran has an embassy in Muscat whilst Oman has an embassy in Tehran. The Arab country is usually known as a mediator, particularly between Tehran and Washington. In addition to strong diplomatic and political ties, the two countries cooperate economically on several fronts, including energy. Meanwhile, Iran and Oman have opened a joint bank to facilitate their mutual financial dealings, agreed to develop the Kish and Hengam gas fields in the Persian Gulf.